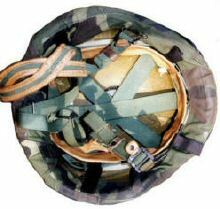 "Experimental Argentine compo helmet, made by Paulamar S.A., in the 90s, with the cooperation of Citefa, the government company for military investigation. The official name is CABAL (casco balistico) M6 helmet , never adopted." "Israeli-made Rabintex Classica bought in the early 90s for the army, used mostly with paras and rapid reaction units, 1200 units imported. 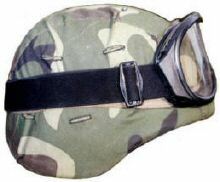 The cover is a 90s local product made with Chinese woodland fabric, the classic Argentine goggles are French-made Sambuee, used also in the Malvinas/Falkands war. " 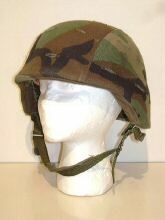 "US-made PASGT helmet, used in the 90s by naval infantry, and later with the army, the cover is US made. 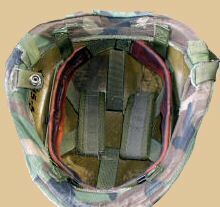 This particular helmet has a pair of non-official pads locally added."